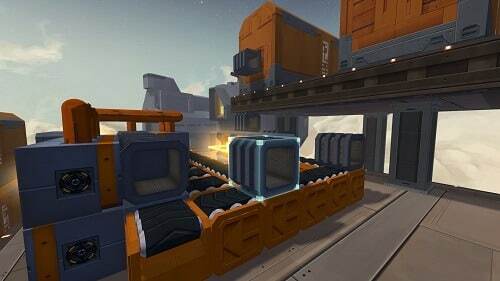 Infinifactory throws players into an alien controlled facility as you create assembly lines in first person for blocks to go from point A to point B. With many different block types to master, a competitive leaderboard and dark sense of humour there is plenty to enjoy in Infinifactory. 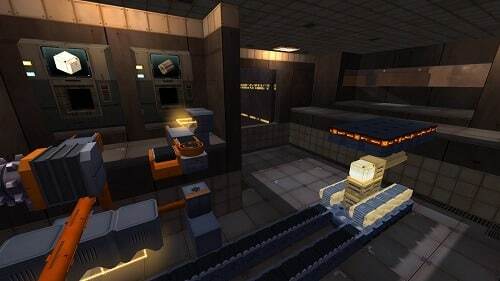 Infinifactory is a highly structured experience with players selecting levels from the central hub which also serves as their prison to the alien captives. In addition to this strange setup players will find audio logs as they adventure through the levels left by other captives who have seemingly gone insane in their own ways from the never ending block based puzzles. With each puzzle you’ll unlock new puzzles across the 6 worlds which introduce new mechanics, challenges and blocks to use to meet the levels objectives. These requirements involve transporting blocks from their spawn to the intended delivery point, while this sounds like a straight forward task you’ll also need to consider things like block modification to turn them into the appropriate delivery form. In order to make this happen you’ll have to place blocks (unlimited) to transport between the two aforementioned points. Basic blocks include things such as the conveyor belt, welder, sensors and a broad range of other devices that grow increasingly complex as you advance. Placing these optimally in first person mode is where you’ll find your puzzle solution which is then compared against other gamers. Unlocking the full potential of each and every tool at your disposal and the dark humour ensure the over thirty puzzles are enjoyably addictive. Move blocks around for your evil alien overlords. Use the large variety of blocks to be the most efficient captive. Over 30 levels to test your brain power. Use your jetpack to seamlessly move around levels. For computer and PlayStation 4.